Grand Central Hotel Shanghai is situated in the bustling Bund-East Nanjing Road Pedestrian Street commercial area in Shanghai. 3-minute walking to metro subway line 1, 2 , 8; 20-minute drive to Shanghai Hongqiao Airport, 45-minute drive to Shanghai Pudong International Airport. This unique and elegant five-star hotel has 353 rooms, offering a comprehensive range of luxurious amenities, including high-speed internet access, lavish bath amenities and convenient high-tech automation features. Whether visiting on business or escaping for a romantic holiday, the Grand Central Hotel Shanghai pampers guests with classic grandeur and dynamic service. Another highlight of Grand Central Hotel Shanghai is the Shanghai Grand Ballroom, a stunning, pillar-free room with an astonishing seven-metre high ceiling. World-class meeting facilities ensure that every event is a success. The Grand Central Hotel offers a choice of two fine hotels: enjoy authentic French cuisine at L’ile de France, or explore contemporary Cantonese delicacies at Bo Yuet Hin. 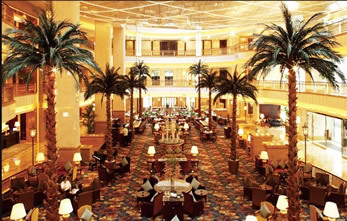 The coffee shop and lobby lounge are also available for casual gatherings. 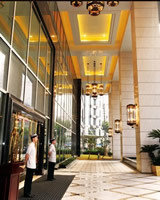 Grand Central Hotel Shanghai on offer are all kinds of deluxe rooms and suites equipped with international dial phones, bathtubs, hair driers, in-room safes, coffee/tea makers, mini bars and refrigerators. 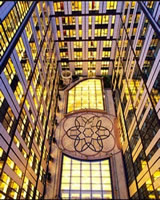 Many employees of our hotel can speak in English, if you need travel in the city, you can ask the business centre or the Reception desk. If you want to book the train tickets or air tickets, you can and you will get help in the business centre. You can use OOD or DDD in your room to contact with your anyother person, you can enjoy your breakfast in the dining-hall, you can have a beer or tea or coffee in the bar. All services will make you as your stay in your home. © Copyright ©2009-2017 WWW.GRANDCENTRALHOTELSHANGHAI.COM. All Rights Reserved.